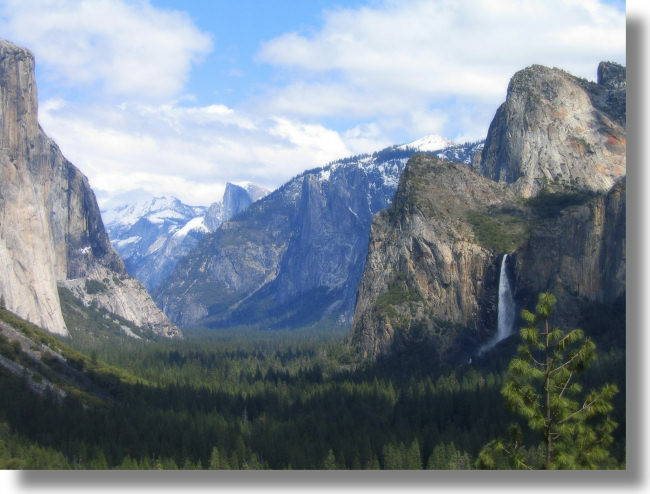 The Tunnel View is probably Yosemite's most famous vista. Lots of famous landmarks are visible here, including, from left to right, El Capitan, Clouds Rest, Half Dome, Sentinel Rock, Sentinel Dome, Bridalveil Fall, and a tree. If you enter Yosemite Valley via Highway 41, this will be one of your first glimpses of Yosemite Valley; you'll see this immediately upon exiting the eponymous tunnel just uphill from the viewpoint. If you entered Yosemite Valley via another route, follow the signs to Bridalveil Fall (or Highway 41), but continue uphill past the falls to this spot.